This Hollis Tec package includes Hollis’ HD200 BCD, the Hollis LX 200 1st and 2nd Stage Regulator, Hollis LX100 Occy and Hollis Slimline Pressure Gauge. Hollis HD200 BCD Comfort and Tech in one. 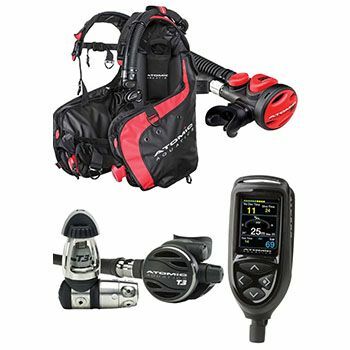 The Hollis HD200 LX Scuba Package includes the Hollis HD200 BCD is fitted with a combination of Tech/Rec features and updates for 2014 that provide ultimate comfort and function. 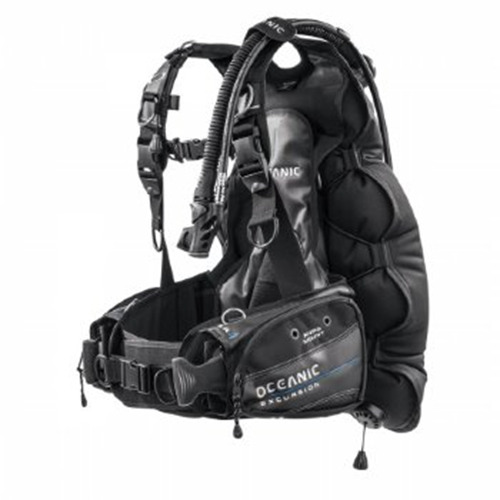 Heavy duty construction and innovative design make the Hollis HD200 BCD the best in class. 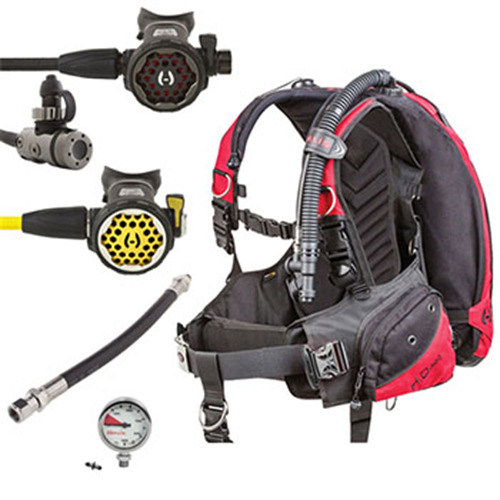 The Hollis HD200 Heavy Duty BCD is built to suit recreational diving and then kit up for more technical dives. Built in features allow for Tech additions and still be streamlined. 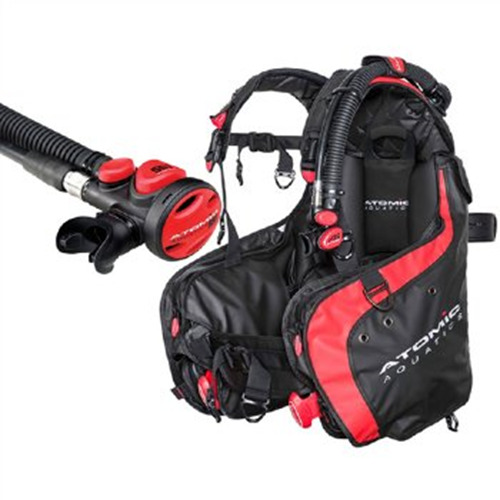 The Hollis HD200 Heavy Duty BCD has a 35 lbs bladder in Small & Medium sizes / 45 lbs bladder in Large & XL sizes. 1000 denier CorduraTM with lamination outer shell & 15mm urethane internal bladder. Contoured, lightweight backpack with back pad, lumbar support, and a rolled neoprene comfort neck. 10 lb (4.5 kg) interchangeable quick release weight pockets with new pinch and pull buckle. 5 lb (2.27 kg) non-dumpable rear weight pockets. System weight: 9.4 lbs (4.3 kg). Traditional 2″ waist strap with Stainless buckle. 2″ Nylon waist strap with quick release buckle and 2″ SS D-ring. New 10 lb pinch and pull weight pockets. The Hollis 200LX Regulator with DCX First Stage is our flagship regulator; designed for extreme environments. Every feature and detail of this new product provides you with the confidence of 40 years of manufacturing life support systems. The Hollis 200LX Regulator can be converted from a right-handed to left-handed hose configuration. It can be changed in a manner of minutes without the use of specialty tools or calibration. The valve and every other metal component of the 200LX is “PVD” Industrial Plated. This is an external finish added to outperform and outlast any other regulator finish. Pneumatically balanced PVD plated brass valve results in smooth, easy breathing. Reversible demand valve, can be converted from right-handed hose configuration to left-handed hose configuration. Diver adjustable inhalation knob, allows diver to customize inhalation effort. Adjustable Dive/Pre-Dive switch: Large Venturi lever has a soft rubber grip, which makes it easy to locate and use. Ergonomic exhaust channels bubbles away from field of view and reduces exhaust effort. Improved orthodontic mouthpiece with dual color tabs. PVD plated stainless steel metal ring, adjustable knob and Dive/Pre-Dive end cap. The Hollis 200LX Regulator comes standard with MiFlex® braided hose. Available in Din or Yoke options. Paired with the new DCX 1st stage. Free Parts for Life (conditions apply). 2-Year Service Interval with yearly Inspection. To finish off, the Hollis HD200 LX Scuba Package includes the new Low-Profile Brass SPG with scratch-resistant lens, high-contrast background, luminescent needle, low weight and small size allow for a more streamlined rigging and are ideal for stage and deco bottles.